Mind Control came out of his second consecutive breeze in good order and remains on target for the Breeders' Cup Juvenile on November 2 at Churchill, trainer Greg Sacco said by phone Sunday morning. 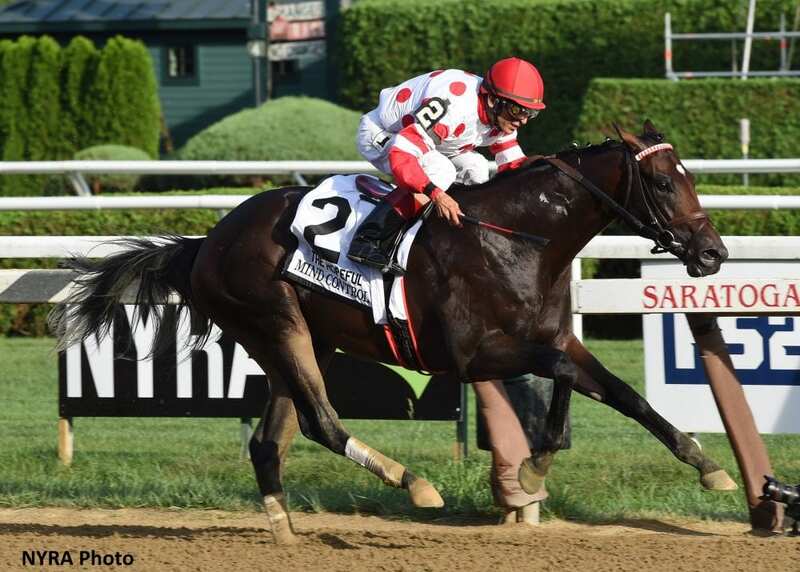 The Stay Thirsty colt made a splash in his stakes debut, winning the seven-furlong Grade 1 Hopeful by three-quarters of a length over Mucho on September 3 at Saratoga. After breaking his maiden at second asking on August 12 at his home base of Monmouth Park, Mind Control earned an 84 Beyer for his Hopeful win in the eight-horse field. The original plan was for Mind Control to make one more start before the Juvenile, but he was scratched from the Grade 1 Breeders' Futurity on October 6 when he came down with a fever prior to the race. Working in company with Candy Cane Lane, Mind Control breezed six furlongs in 1:13.80 Saturday at Monmouth. That built on his five-furlong work in 1:02.00 over the same track on October 14. Mind Control has stretched out in distance in each of his three career starts, beginning with his runner-up effort at 5 ½ furlongs on July 5 at Delaware Park. He will now take aim at the Breeders' Cup Juvenile 1 1/16-mile distance, which will mark his first race at longer than a mile. Mind Control has consistently either set the speed of the race or been right off the pacesetter, though Sacco said Mind Control doesn't need one particular type of trip to be successful. His conditioner also said jockey Irad Ortiz, Jr. will pick up the mount for the Juvenile. Mind Control, owned by Red Oak Stable and Madaket, has impressed Sacco with his intelligence. This entry was posted in Breeders' Cup, NL List and tagged benny sanchez, Breeders' Cup, breeders' cup juvenile, churchill, Greg Sacco, hopeful, mind control, Monmouth, stay thirsty by NYRA Press Office. Bookmark the permalink.